Housed by the Hotel Indigo Rome - St. George, a 5 star luxury boutique hotel in the of Rome's city centre, I Sofà Bar Restaurant & Roof Terrace is a contemporary design location where modern details and vibrant colors perfectly blend with testimonies of a glorious past. 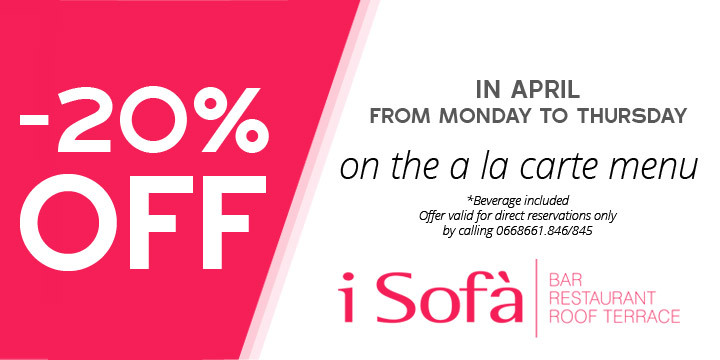 I Sofà Bar Restaurant & Roof Terrace welcomes not in-house guests for breakfast, lunch, aperitif and dinner. During the summer season the bar and restaurant move to the Roof Terrace, weather permitting. The Roof Terrace located on the top floor of the hotel offers a breathtaking view of the capital. Enjoy our chef's specialties at lunch and dinner and let yourself be enchanted by the scenery that surrounds you with, fascinating domes and roofs. Choose your favorite cocktail or try one of the craft beers and local wines while admiring a beautiful sunset or contemplating a starry sky. From April the Roof Terrace is open from 12pm to 5pm for bar and lunch services, weather conditions permitting. From May the Roof Terrace is open from 12pm to 1am for bar, lunch and dinner services, weather conditions permitting. I Sofà Restaurant, located on the ground floor of the Hotel Indigo Rome - St. George, features a sequence of intimate snugs where ancient walls, travertine marble and contemporary design blend together for a truly unique atmosphere. In spring and fall, sofas and tables of the internal courtyard are the perfect setting to enjoy either breakfast or a drink accompanied by the pleasant temperatures of Rome. 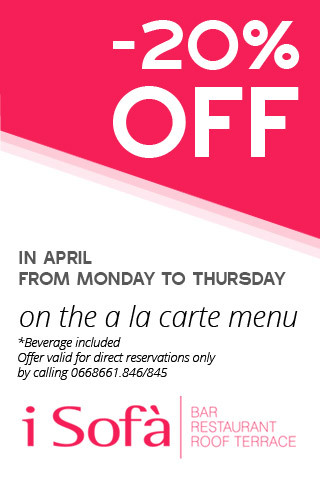 Celebrate Easter with us at the I Sofà Bar Restaurant & Roof Terrace. Enjoy an extensive menu served in the elegant setting of our restaurant and celebrate a day dedicated to tradition and good food together with family and friends. I Sofà Bar Restaurant & Roof Terrace menus vary according to the seasons. Chef Filly Mossucca opts for local suppliers to guarantee high quality of raw materials, follows the tradition of the typical Roman cuisine to always offer a truly local experience and selects regional producers to support regional excellences and spread the food and beverage culture of the Lazio region and Rome. Girl power! Meet our new Chef, Filly Mossucca. Pink sensitivity and creativity for a brand new journey. A menu with strong personality but a gentle soul. Thanks to its multifunctional spaces and to the possibility of reserving them for private events, the Sofà Bar Restaurant & Roof Terrace is the ideal location for corporate events and to celebrate special occasions for up to 100 people. The Internal Courtyard with its lively colors and relaxing atmosphere can host events for up to 50 people, while the Mezzanine Terrace with its enchanting view over the elegant historical palazzi can take up to 120 people. Finally, the Roof Terrace, located on the hotel's top floor, can welcome up to 80 guests and treat them to a wonderful view of the Eternal City.